The propeller of a World War II fighter plane is 2.30 m in diameter. What is its angular velocity in radians per second if it spins at 1200 rev/min? What is the linear speed of its tip at this angular velocity if the plane is stationary on the tarmac? What is the centripetal acceleration of the propeller tip under these conditions? Calculate it in meters per second squared and convert to multiples of $g$. This is College Physics Answers with Shaun Dychko. The propeller on this fighter plane has a diameter of 2.3 meters but we want the radius for a lot of our calculations. So we'll divide that diameter by two. Thus 2.3 divided by two is 1.15 meters. In part A we're told that it has an angular velocity of 1200 revolutions per minute and we have to convert that into radians per second. So we multiply by one minute for every 60 seconds which cancels the minutes and leaves us with seconds in the denominator, and then multiply by two pi radians for every revolution, leaving us with radians on top. So we have 1200 divided by 60 times two pi. That gives 126 radians per second. Then we're meant to find the linear velocity of the tip of the propeller and so that's going to be its radius times its angular velocity. So it's 1.15 meters times 125.66 radians per second, giving 145 meters per second. 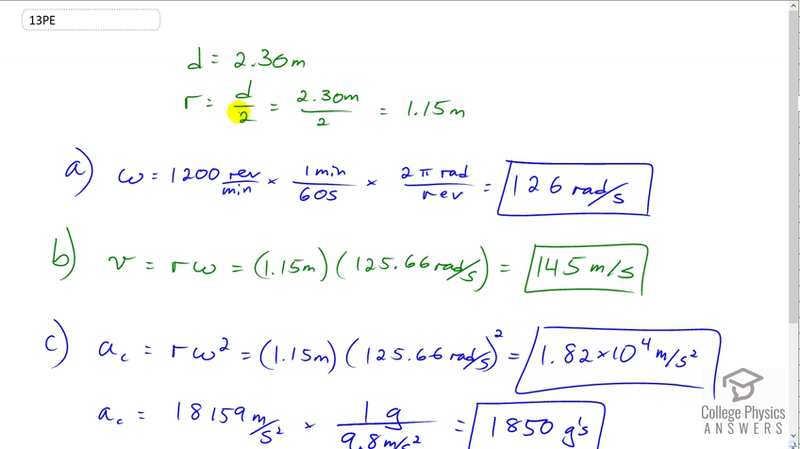 The centripetal acceleration is radius times angular velocity squared and I could have used the formula linear velocity squared divided by radius but this quantity is the result of two calculations. First of all, we had to calculate linear or the angular velocity and then do another calculation with that angular velocity. So there is two chances for making a mistake in this number, 145, whereas there is only one chance of making a mistake in this number. So, when you're using calculations in subsequent calculations it's best practice to use the one that has the fewest calculations there to reduce the chance that you're using a number that has a mistake in it. So we have radius of 1.15 meters times 125.66 radians per second and square that, giving us 1.82 times ten to the four meters per second squared. Converting that into multiples of g, we take that meters per second squared and multiply it by one g for every 9.8 meters per second squared. So this is kind of like a package that cancels with that, leaving us with units of g. So 18159 divided by 9.8 gives us 1850 g's.